I have tried almost every kind of drugstore product out there during the past 10 years of my life. The skin care routine I am using now controls my breakouts during the whole month, however I still get my hormonal acne, which I can not do anything about. 2. 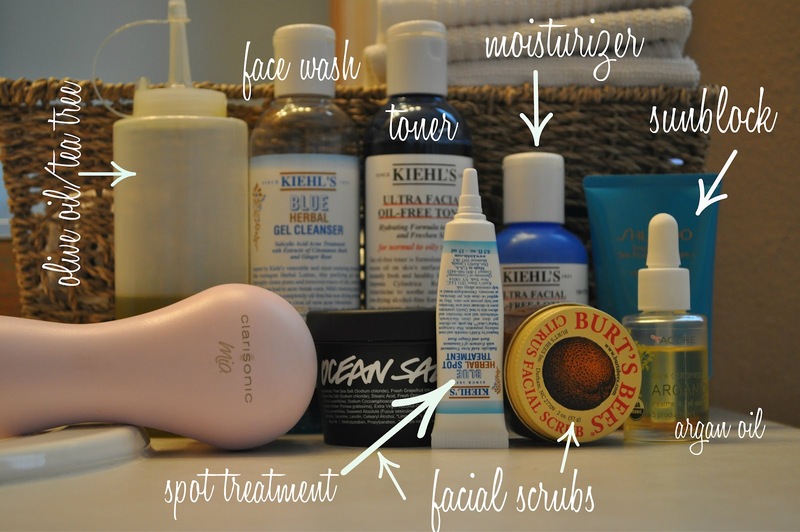 I use this face wash morning and night: Kiehl's Blue Gel Cleanser. I love using this with my clarisonic. It feels very tingly on my face and dries out my breakouts without drying my skin. 3. I use this toner morning and night: Kiehl's Ultra Facial oil-free toner. 4. I use this moisturizer morning and night: Kiehl's ultra facial oil-free lotion. I really like this moisturizer, I can honestly say that when I get the any dry patches, this does wonders. 5. I use this sunblock in the mornings, I have to be very careful with my face with my hyper-pigmentation. 6. I use the Kiehl's blue herbal spot treatment on my breakouts. This is by far the best spot treatment I have EVER used. I put it on at night and by morning the breakout is dried up. 8. I started using Argan oil for my hyper-pigmentation. I use it as a serum at night before my moisturizer. I can't say I have noticed any results yet. I will most likely be picking Kiehl's Dark Spot corrector next time I can. 9. For my mask, I usually use Lush masks, however I ran out and have not had any chance to pick more up. I got this sample of Mario Badescu healing and soothing mask. I honestly heals and soothes my face. I will be picking up a full sized one next time I can. Thats my skin care routine for now. Have you used any of these products? What are your thoughts on them? Do you have the same skin as me? What have you found that works for you? The olive oil doesn't break you out? I have the same skin as you from what you described and I wold be terrified to put olive oil on my skin. What is your ratio for you oil mixture? No it does not cause me to break out, because I wash my face right after I take my makeup off. I am sure if I walked around with oil on my face, then that would cause me to break out. I only put a few drops of tea tree oil to get rid of the EVOO smell. I put a dime sized amount of the oil in my hand and rub my hands together, Then I rub the oil all over my face and eyes, It melts all the makeup off. Then a wet a clean washcloth with warm/hot water and place the washcloth on my face (like a facial) then I start rubbing off all the makeup. It comes off really quick. After that I use my face wash to wash my face. I used to use makeup remover wipes, but those are expensive and kind of rough on my face. I have been using the oilve oil since FEB, and have loved it. My skin is just like that (super sensitive, oily but prone to dry patches, and how unfair is it to get more acne the older I get?). A few things I that I love are SkinCeuticals Sheer Physical UV Defense SPF 50 (first sunblock that hasn't made my face break out ever) and La Roche-Posay Redermic+ (Vitamin C for sensitive skin). Both expensive, but so worth it. Also have you tried a Retinol cream? It really helped improve my skin, especially dark acne spots. Start slowly, a low (.5%) every other day, and work up to every day, then switch to higher (1%) every other day, then eventually every day. SkinCeuticals Retinol is wonderful, but I haven't tried other brands. Just make sure they list the percentage. I love your beauty round-ups, and the birch box reviews! Keep 'em coming!